One of the things I really like about new technologies today is when big transitions are truly seamless. Arguably the most common example is what is happening with Microsoft Exchange and Microsoft Office 365. A few years ago, Microsoft Office 365 became an attractive option for a new platform for one of the most critical sets of applications for effectively every organization. It is also a relatively seamless transition as many of the same consumption mechanisms are maintained: Outlook, Web Access, Mobile, etc. However, one interesting characteristic is unique to this Software as a Service (SaaS) use case: Organizations take some time to do it. I can recount many conversations around this as Veeam announced, then launched and then enhanced our product in this space: Veeam Backup for Microsoft Office 365. The conversations span many years — along with the migrations. When I visit a customer at first, they’ll say they are “piloting” Microsoft Office 365 with a few users such as the IT staff. Then next year, I visit and they’ll report they are “about 50% complete” with migrations. On the third year, I’d get information from the same organization that they are “90% migrated.” While every implementation and experience is different — it is possible that many stories are similar. One of the key benefits presented by this configuration is that the organization can have the same configuration and backup solution for effectively a hybrid SaaS deployment. Hybrid in that the result is that this business application (mail and calendaring service) is both on-premises and in the SaaS space. 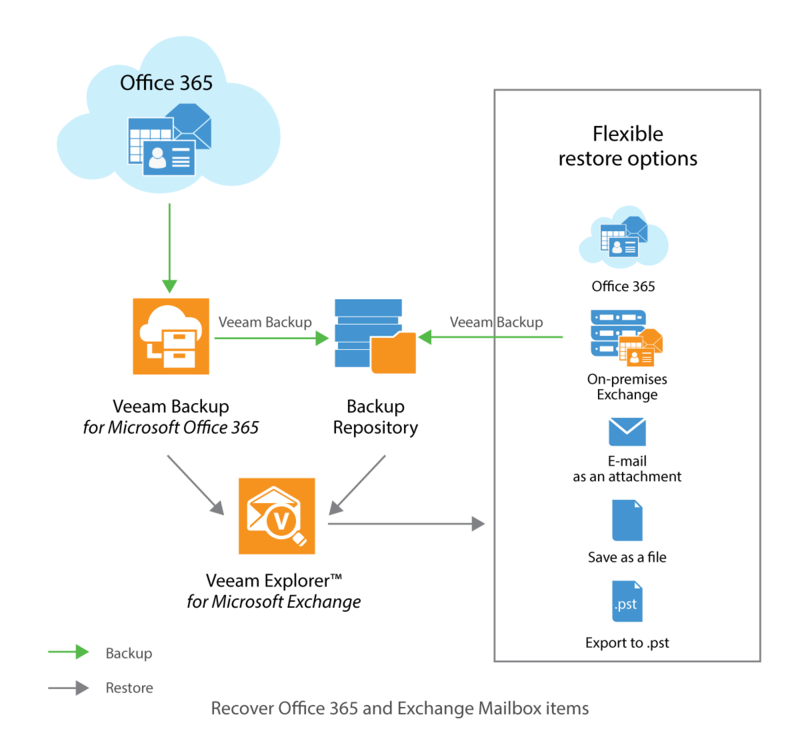 Having the consistent approach with Veeam Backup for Microsoft Office 365 is a good practice in a backup policy to ensure that no mailboxes are omitted from backup between many products during an organization’s migration process. This unified approach also permits migration capabilities between Office 365 and on-premises Exchange. This restore wizard starts the intuitive process to restore data back to either Office 365 or on-premises Exchange with ease. Exports are also supported — so building a PST file or a list of objects can also be done. Just like having the right restore for any situation, having the right backup for any configuration is a strong capability of Veeam Backup for Microsoft Office 365. This is the type of approach that is needed today for the demands on critical systems and data. 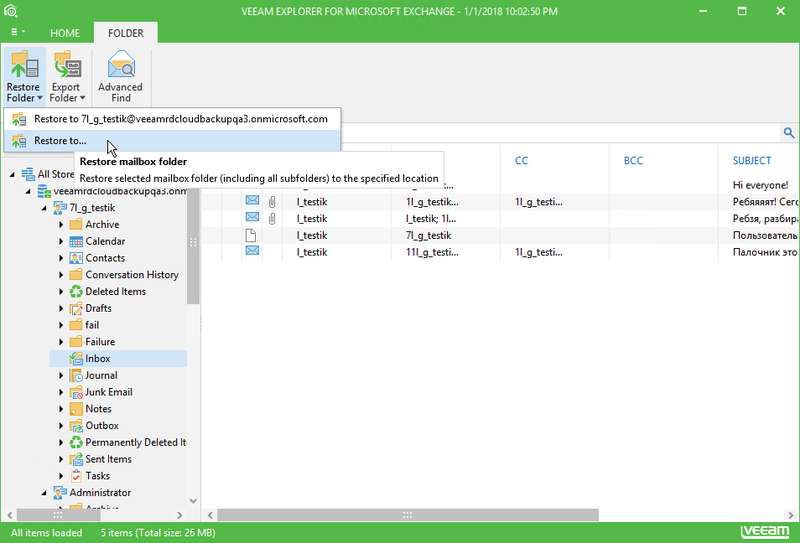 If you haven’t played with Veeam Backup for Microsoft Office 365, download a trial now — or our NFR program that permits up to 10 user mailboxes to be backed up for free. Are you operating a hybrid Exchange and Office 365 deployment? Does Veeam’s ability to protect both in a consistent manner appeal to you? Share your comments below.